While the traditional orientation process at the University of Colorado Boulder was meant to bond new students to the institution from their first moments on campus, its structure often had just the opposite effect. Two early-summer "welcome days" packed with face-to-face presentations and panels blasting participants with a firehose of information were bound to leave students feeling numb. By the time they returned to campus in August, they'd have forgotten much of what they'd learned. And most of the participants for that early orientation were Colorado residents; non-residents would typically only show up in the week before school began. That meant orientation was timed to overwhelm them just as they were about to dive into their new college careers. So the university came up with a different approach. The "New Student Welcome Online Experience," introduced in 2015, doles out content just in time, using a blend of videos, text, quizzes, checklists and rewards to engage and entice students to learn more continually. 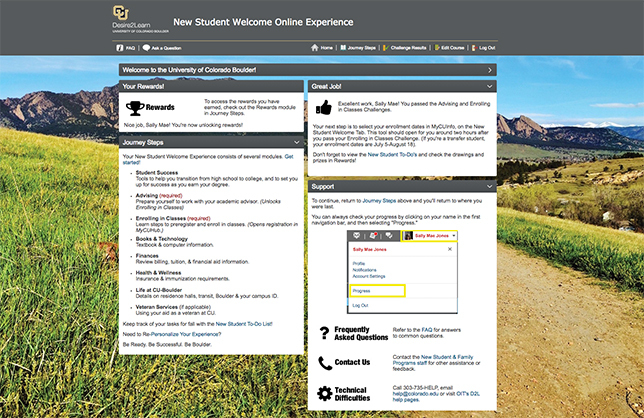 The platform for delivering the online experience is UC-Boulder's existing learning management system, Brightspace from D2L. Those in-person new-student welcome days still exist, but now they're optional. As a result of the move to this online orientation "course," student IT processes have been streamlined, the amount of information shared has been pared down to the essentials, and students get a training on the LMS they'll be using when their classes begin. Ultimately, the university hopes, the "online experience" will improve retention rates. The online orientation initiative would never have succeeded without a major push from administration, said Jennifer McDuffie, director of New Student & Family Programs for the university, who served on the coordination team for the project. "We had the highest leaders on campus say, 'This is what we're doing. You need to move forward,'" she recalled. The turnaround was rapid, added Courtney Fell, learning experience designer in the Office of Information Technology (OIT). The provost's office began talking publicly about the project in December 2014. McDuffie joined her group as interim director in February 2015. And by May 2015, the initial orientation course was launched. While CU-Boulder faced the predictable human resistance to change, it put in place measures to help ensure success. "One of the things I heard was, 'For 10 years we've been doing it this way, and you're changing it,'" said McDuffie. But a combination of "strong leadership, a really transparent process, transparent deadlines" and a willingness to let everybody test the system and give feedback throughout the process helped bring along the 300 to 400 internal stakeholders who played a role in the development of the online orientation. "The change was more about getting to know the families and the relationship-building. It wasn't necessarily about the business getting done or the information being distributed," said McDuffie. Now that the first year is over and the university was able to enroll its largest class ever, those reticent stakeholders have shifted their attention to fine-tuning their orientation messages to make the content more interactive and engaging. As an example, campus advisers were accustomed to meeting with new students in person and asking them just the kinds of foundational questions one would expect: What do you want to do over the next four years? What are your goals? What are your interests? "They really thrived on those relationships," said McDuffie. "So last year when we went online, we asked those same questions, but it was a quiz prior to a student's advising appointment. That information is still being collected, but not by the same route." Now, when advisers meet with students, they go into the conversations "with a little bit more knowledge than they had before," she said. As another example of the makeover, delivering information about student expectations and student rights and responsibilities would previously consume three to four 60- to 90-minute sessions. That content was converted into 15 or so online components. Those include a handful of videos that discuss the honor code and student behavior code, which can be viewed in about 15 minutes, and another module that's about 40 minutes long to cover Title IX discrimination, harassment and sexual assault. That mandated content has a quiz that all students are required to take, to make sure they understand the key points. Once the students have arrived on campus, they're also expected to take in-person "bystander" training that lasts another hour. "It's perfect," McDuffie noted, "because that's when they're actually going to experience some of the scenarios that we're providing them with." This "flipped" learning process, which now permeates the online orientation, encourages the students to come to campus prepared: They have digested much of the information online ahead of time, allowing the in-person activities to be more interactive. Now students spend about two hours on average in the online experience, another 30 to 45 minutes in the community equity module and 15 to 20 minutes in the pre-arrival information for orientation. But aside from reducing the amount of time committed to new student orientation, the online approach offers another benefit: Students can come back to it when they need a refresher. In June, students may not care about where to park their bicycles or how to register their laptops on the network, said McDuffie. But when course enrollment periods come up, it's a different matter. "So we actually see a lot of students going back and visiting the different modules or themes within the learning experience, because at that time, that's what they want to know." "They're seeing this as their one-stop shop for orientation and first-year information as they're getting here," added Fell. "They don't have to know that for money-related issues they go to the bursar's office or financial aid. They don't have to remember the names of those offices. These are their training wheels to get them accustomed to our naming conventions and university resources." To customize the online experience for each student, the system taps into information maintained in the student information system, such as school and major, to make sure individual students receive advising guidance that's applicable to them. "We really want it to be specific to that student's experience," said Fell. Each student's online orientation begins with a pared down version of the available information. "They have a highly scaffolded introduction to the [orientation] course," Fell explained. "They don't see all of the resources at once. We don't want to overwhelm them." Then they're asked just five or six questions — a personalization checklist — to allow them to indicate whether they're a first-year or transfer student, a veteran, living on campus or off, and the like. "Those responses are tied to release conditions behind the scenes," Fell said. For instance, once new students have worked through various mandatory steps, the university's "hold" on their registration records is lifted, and those students are allowed to register for classes. "And then once the course fully opens or the resource opens to the student, they only see that information that is most applicable to them." That customization has worked well for 99 percent of the university's domestic students, she added. Once students work through the introductory requirements in the New Student Welcome Online Experience, they get access to additional modules, personalized with the information most relevant to them. While some of the orientation content is mandatory, plenty of it is optional, depending on the outcome of that customization experience. To entice students to go through that elective material as well, the university built a reward system using its Qualtrics online survey software. "We worked with a number of campus offices to create incentives and coupons for these incoming students and really capitalized on how to familiarize them with some of these awesome on-campus resources and experiences that they may not know of when they first get here," explained Fell. "For example, after students completed a certain module and successfully completed a quiz at the end of that module indicating their comprehension of that material, they would unlock a reward." Rewards consist of discount coupons at the university store and tickets for visits to the on-campus planetarium and the annual international film festival. Some of the orientation training leads to entries for bigger prizes, such as a four-year university sports pass and scholarships for study-abroad opportunities. The university has since backed off on the use of quizzes for non-required material, choosing to go with tasks lists instead. "This change was made to better meet the needs of our incoming students who like to know exactly what to do to get off to a good start," noted Fell. "We realized that checklists/task lists that they could tick off to track their progress and return to would meet their needs better than a quiz." The reward system has been effective. "It has motivated three out of four students to finish the non-required content in the environment," said Fell. Despite the wealth of information available in the online environment, students often have additional questions — and they expect a fast response. Orientation staffers need to be available for quick follow-up, noted McDuffie, because students will access content "at all times of the day and the evening." One useful addition to the system has been a "Get Help" button, which students can click when they get stuck. From there they can submit a help ticket, live-chat or text with somebody in McDuffie's office, and post to a discussion board. Using Zoom, the campus web conferencing application, students can also do screensharing or have a video chat with a staff member. In 2015, the university actually extended office hours in the evening, but backed off of that in 2016 because students weren't using that resource. The other help mechanisms seem to keep them satisfied, noted McDuffie. Students also want to be able to access resources quickly. "These are very smart and technically-savvy students," observed McDuffie. "They want things immediately. If they complete the checklist and hit submit, they want their modules to open up. If they complete a module that releases a hold, they want that hold lifted immediately." Previously, the system could take between an hour and six hours to sync new information; however, OIT is trying to bring that wait time down as much as possible. While the online experience was introduced with retention in mind, it's too soon to say how that will work out. However, there have been plenty of other benefits. Taking orientation services online has helped to identify gaps and nuances that posed challenges to students. For example, the processes weren't always clear for double majors or transfer students, so that area has received extra attention. Likewise, because students have between eight and 12 systems to "navigate through," as McDuffie put it, OIT has worked hard to present information in a streamlined fashion, using single sign-on as opposed to forcing students to go to separate websites to take action. Likewise, the whole endeavor has encouraged departments to cut down on the amount of information they try to impart to students. "We did a lot of handholding to get the offices to streamline their information for incoming students," Fell acknowledged. "I've watched [our students] go through the environment when we do usability testing. As everyone suspects, they do not read every word we put into the modules. Every time we can give a bulleted list or create a checklist they can follow up with afterwards — 'OK, I need to do this, this and this' — that's the most important piece. That was good to see." Now the university is working on how to grant guest access to the orientation materials to allow families to get to the new student information they want. Conversations have also begun on expanding the focus from welcoming undergraduate students to onboarding graduate students and even new faculty and staff members. "As a result of the online experience, advising was able to work with students at their own pace. Students were able to engage with advisers in a more relationship-focused model with more individualized attention," Fell reported. 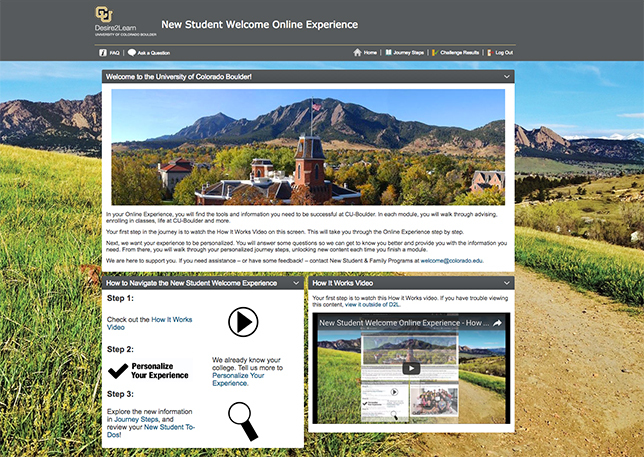 "The online experience allowed students to learn pertinent information in their own way, and was something students could revisit through the summer and their first semester at CU. The online experience also allowed students to become familiar with the online resources and supports CU offers before they even started their first semester." Test naming with students. University of Colorado Boulder Learning Experience Designer Courtney Fell said that although the online orientation project began by naming each module based on the office that "represented" or supplied given content, usability testing with students quickly revealed the flaw in that thinking: university office names are not always intuitive for outsiders. "So we went back and made all of the naming and language really appropriate for the incoming students." Give offices control over their content.Because all of the materials for the online orientation are housed in the learning management system, there's no reason departments can't maintain their own resources. To accommodate that, said Fell, "We created a lot of custom roles in Brightspace for our campus." For example, advisers are allowed to see specific student information and change some of it, but not all of it. Likewise, campus leaders wanted to explore the system "from the student perspective," so that meant creating a role to allow them to do so. Consider multi-modal delivery of video. The university uses YouTube to host most of its video content, which is then embedded into the orientation "course" in Brightspace. But it also uses Kaltura, the institution's media streaming application, to give video access to students in China, who can't get to YouTube. Each YouTube video includes a Kaltura link. Make everything accessible.All of the content used in the new student orientation is "captioned and accessible," said Fell. "We worked purposefully from the get-go with a screen reader tester to make sure the whole course was accessible to our incoming students who use screen readers. So that helps with the usability of every student on campus." LMS usage will grow outside the classroom. With a program like this, you may find all kinds of new adoption of the LMS for training purposes. At CU-Boulder, for example, that new demand has persuaded the IT team to set up a system specifically to work with those non-academic departments.